There are several applications that exist in recent times with more being developed at a rapid pace. These apps which are mainly web and mobile phone applications can most commonly be found on platforms such as Google play store for Android and the app store for IOS. Mobile phone apps cover categories from such as games to health and finance to organisation. Nonetheless each app has its own relevance and plays diverse roles for the millions of users that troop the app stores. With the sharp rise of mobile penetration in Ghana, many apps have been developed in and outside Ghana that are enhancing the quality of life in Ghana. These apps are enhancing the quality of life in areas such as communication, education, agriculture, finance, governance etc. This article will look at some of my personal favourites. MPower is a payment system that is built to work with any preferred wallet or bank account in Ghana to offer a safe and convenient payment experience. These wallets could be in the form of Airtel mobile money, MTN mobile money, Tigo cash, master card, speed banking or Visa electron to name but a few. This app offers online and mobile payment transactions to enable consumers and businesses send, spend and receive payments. Money can be loaded from any preferred electronic wallet that operates in Ghana or bank account to MPower to shop online. Money can also be sent from a PC or mobile phone device to be transferred and from anyone in Ghana. Individuals and business owners just have to integrate MPower into a website, phone or store to start accepting payments. It’s sometimes a hassle accessing one’s money but with MPower there is a payment system that helps offer a solution to this by giving Ghanaians the platform to perform many types of transactions with ease. Esoko began in 2005 as “Tradenet” and was renamed Esoko in 2009. The name is derived from “soko” which is Swahili for “market” and the “e” represents “electronic”. It is a Ghanaian innovation that uses a text messaging system and online platform to bridge the information gap faced by farmers within Africa. There are currently 6000 farmers using the Esoko platform across 16 countries in West Africa. Due to high transportation costs, some farmers in rural areas have problems selling their crops at the local market centres. They are then left with the option of selling to other local sellers around them who most at times buy at low costs since these farmers have no idea of the current prices at the markets. Esoko seeks to provide solution to this by providing news of current prices of produce via SMS to farmers and keep them updated with current prices. This goes a long way to prevent them from being cheated once they decide to sell to other sellers around instead of going to the local markets. In addition, Esoko sends weather forecasts and market trends to farmers to help them make informed decisions regarding what to plant at what times. Aside these, farming tips are also sent via SMS to educate them on good farming practices. This platform helps farmers stay informed with consistent and accurate knowledge of the supply chain they are part off. Farmers who use Esoko have reported 10%-30% extra income annually. Esoko is therefore a great application that enhances lives of farmers and helps boost productivity in the agricultural sector of Ghana. Easy Taxi is a taxi booking app in Ghana which helps people (passengers) to get connected to a taxi when they need it. Once the app is installed on your mobile device, a cab can be booked anytime and anywhere in Ghana. This app finds an ideal taxi for you when you tap the app button and confirm your location. Easy Taxi has a cool feature which allows you to see the identity of the driver and car as well as their location relative to your position. Easy Taxi is available for Android, iOS Blackberry and on Windows phone devices. Snoocode is a mobile application that solves the problem of poor address systems in developing countries like Ghana. It provides everyone in rural or urban areas with a unique geolocation based code which can be used to provide directions to any location in the country. In a robust and easy way, SnooCode uses a GPS enabled phone avoiding costly bureaucracy, even where there is no telephone infrastructure. Snoocode allows you to obtain a private code that one can share with the general public (eg. restaurants, shops,laundries etc), send privately to friends and family( inviting them over), share with service providers ( food delivery, Ambulance, police etc) and navigate easily to these addresses using a smartphone. Once you have your code, it serves as your address. You can also use your code when opening a bank account, by simply providing the code to the bank to serve as your address!. 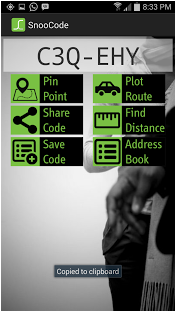 One can easily find his way wherever to his or her destination in Ghana as long as he/she uses the unique snoocode generated by the app and available to the person. As such aggregating these codes can greatly improve logistics in everything from eCommerce to public health. Snoocode has been selected as part of the 40 great apps from 178 UN-member countries by the World Summit Award-mobile Global Champion 2015. Bibioo expense tracker is a simple smart expense tracker and manager which helps an individual to able track his/her expenses on a daily basis. With this, one would have to input his daily expenditure within various categories ranging from food, clothing, entertainment, airtime, automobile, fuel, groceries etc . Bibioo expense tracker has an inbuilt notification and transaction reminder. Bibioo keeps a summary of users transactions and alerts the user especially in situations where more than 80% of their budget is spent before a set time (14:00 hours) and also when they spend beyond the set budget. This is a handy app which helps Ghanaians regulate spending, thanks to the ability to not only track your expenses but also what you spend on. This is a selection of my personal favourites, will like to hear about your favourites. OWSD-Elsevier Foundation Awards for Early Career Scientists.